This is Charlie the Chocolate Labrador, commissioned and required as a surprise Christmas gift. Charlie who is an old soldier, now approaching 13 years, belongs to Paul and Helen German who live in Bristol. Paul contacted me through Facebook, after seeing a previous posting of a Black Labrador called Wilfred that I had painted. I just wanted to drop you a quick message to say a huge thank you for the wonderful painting of Charlie. I hadn’t opened it prior to gift wrapping the picture and giving it to the wife on Christmas Day. To say she was overjoyed is a huge understatement! She( nor the other guests/family we had that day) couldn’t believe, not only the resemblance, but also how you managed to somehow paint the dogs personality as well! Many thanks once again, and wishing you a happy new year. I sold this painting from my gallery, which is housed in a rural complex of North Staffordshire. There is a driven pheasant shoot on an estate about half a mile away. The client who bought the painting is into field sports in a big way and is a member of the shoot. 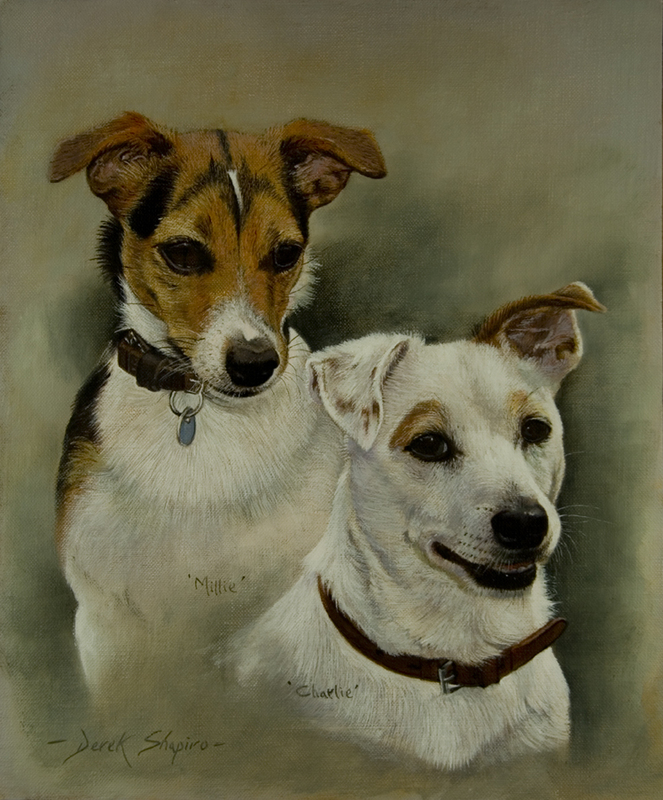 I spotted these two Jack Russell’s hunting rats inside an old farm barn. I spent the afternoon with sketch pad making studies of these Jacks, as they were with much excitement kept busy searching out rats. As I couldn’t sketch them together,as in this final painting, I took separate studies and placed them on a bail of straw together as if they had just entered the barn eager to begin their adventure. Painting available to purchase :: All inquiries please click here. 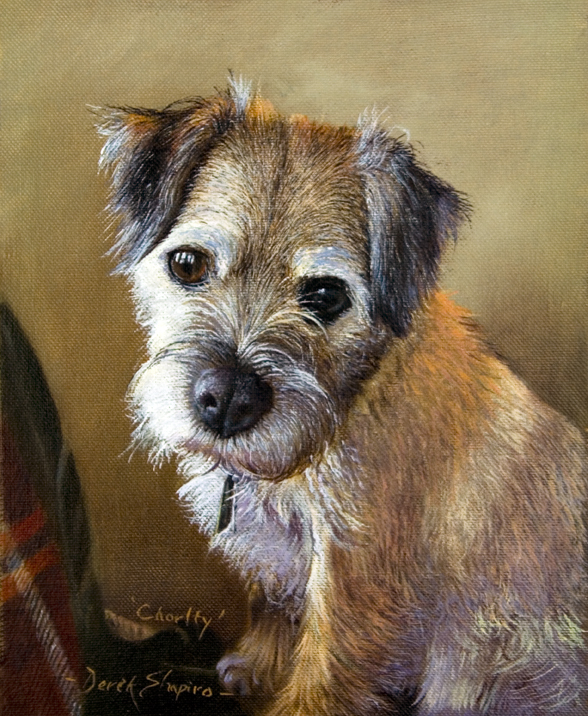 This is a commissioned painting of a beloved dog called Charlie. As well as a pet, Charlie led a busy life as a working peg dog, retrieving game for the client who shoots on the local pheasant shoot. As you can see with the grey mussel and eyes, I thought the title of the painting to be an apt description. Commissions invited, all inquiries please click here. 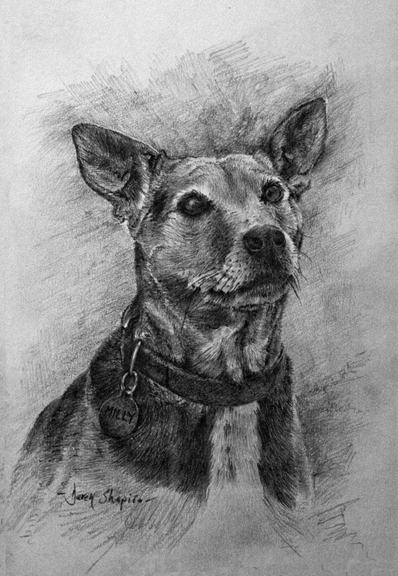 This is a posthumous drawing of a dog. I don’t normally do pencil drawings but as I was asked by a client who wanted to surprise her husband with this drawing as a birthday gift, and as she has bought things off me in the past, on this occasion I said that I would and decided to let her have it at a discounted price. To cut a long story short, she has never seen the drawing and I’ve not seen her since. Fortunately for me this type of occurrence has never happened before, so to put the drawing to use, I decided to create a new gallery that will show off any drawings that I decide to do in the future. In the past the only drawing that I’ve done are preparatory sketches for paintings where I go straight in with a brush. As far as the discipline of drawing goes, age and indolence has caught me up and I intend to use a pencil a lot more, there is nothing quite like it to teach you about light and shade. This is Louie the Red Fox Labrador, commissioned and painted for a client who is local to my village. I went to see Louie and took him into the back garden and decided on this pose for the painting. I painted Louie for the clients husband which was presented to him for his birthday. 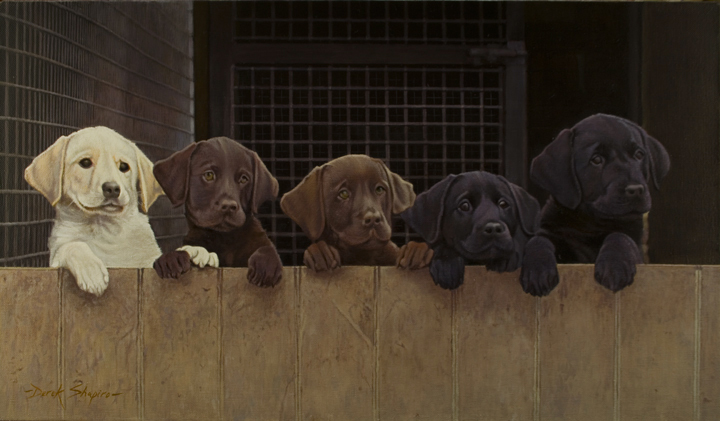 This is a painting of a pet dog called Chorlty. Here you see him standing in his favourite spot with front feet on his chair next to the window. If you would like to commission a painting of your best friend then please get in touch. In the Terrier group, the Border Terrier is a small rough coated breed of dog. Initially bred because of their fearless nature, as a fox and vermin hunter. They are very affectionate, intelligent and obedient and make ideal pets. 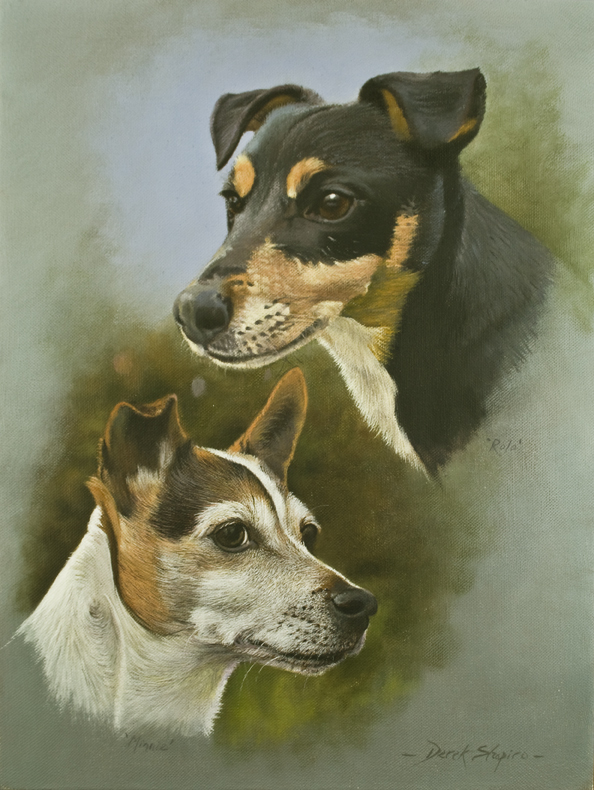 ‘Charlie’ the bottom dog in this painting passed away last September, he was over 17 years of age.